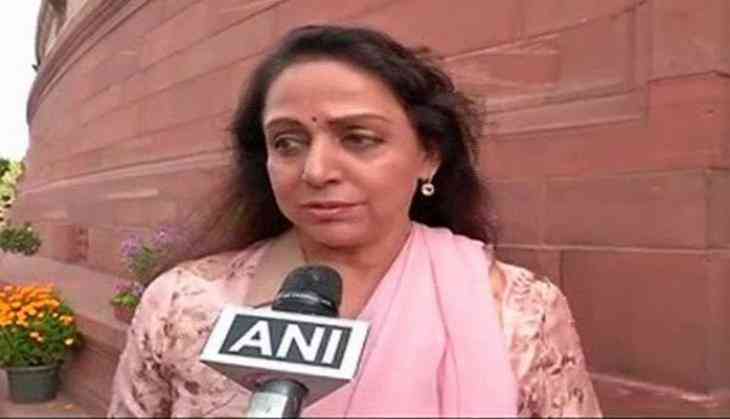 After the murder of two jewellers inside a jewellery shop rattled the holy city of Mathura, its MP Hema Malini on Friday expressed grief over the loss of life and said that she will visit her constituency on May 24. Asserting that she is keeping a tab of all the developments in the matter, Malini said that she is in touch with the authorities and is closely monitoring the investigation. "I am very much concerned with the ongoing incidents in Mathura and keeping a tab on every development. I want to go there immediately but some family commitments also have to be fulfilled. I will be going there on 24th May and will be there for many days," she told ANI in a telephonic interview. "Police officers have apprised me of the situation there and ongoing investigation. I have been told by police officers that they have identified the culprits and have arrested two people. When I will go to Mathura on 24th, I will stay there for a lengthy period. I am in contact touch with the authorities there in Mathura and UP govt," she added. Uttar Pradesh Cabinet Minister Shrikant Sharma and DGP Sulkhan Singh had visited Mathura on Wednesday. Singh claimed that the police had gotten vital leads in the case and that they are hopeful of solving the case soon. Four policemen including SHO of the City Kotwali police station Surendra Pal Singh and the local outpost in-charge have been suspended on charges of dereliction of duty. Meanwhile, the Uttar Pradesh jewelers are on an indefinite strike to protest against the murder. Two traders, Vikas and Megh Agarwal - were gunned down by six armed persons who entered their shop Mayank Chain, in the Koylawali Gali, in the busy market area of Holi Gate on Monday night. They escaped with gold worth Rs. four crore.